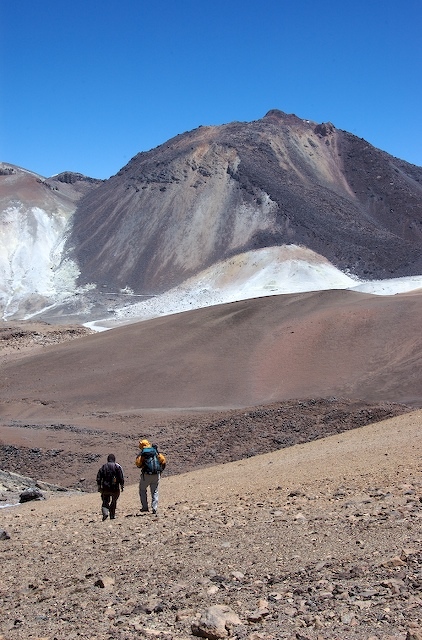 Five days and four nights in the mountain...Never before have we stayed so long in the realm of Licancabur, sacred Inca mountain, some sort of an Island of Avalon in the heart of the altiplano. Testing characters, testing strengths, testing wills. Opening and closing its door at will on the temporal travelers. Will it open for us this time? It is a journey through the body, the mind, and the spirit. On top, an emerald is waiting for us, or is it? It is not a precious stone but it is definitely part of the Inca treasure. They came here to pray and celebrate, around the shores of this unique and mysterious lake. In previous years, we had a glimpse of what could be lying in the heart of this gem, just a glimpse. Last year, the emerald turned ice white. The time had not come yet. As we start our journey this November 16, I am wondering "what is up there for us this time?" We came with so much hope and so much preparation. It will take so little for all of this to be reduced to nothing: Bad weather, sickness, things that we have so little control over. Around us, on that morning, everything is calm. The weather is warmer than usual for the altiplano, there is no wind. Could Licancabur be opening its door... Are we ready? The team is as ready as it can be. I know that for a fact. We are taking with us so much equipment and, for the first time, equipment that should allow us to finally take the time to explore the emerald from the inside if only we can make it to the top, get over our anxiety of entering a mostly unknown realm and fight our own inner dragons...The pain on my right side is sometimes difficult to bear, the result of a few bruised ribs a couple of days prior to the ascent while performing our last diving training in San Pedro. A little over 40 pounds of lead against a few bones...An unfair fight. This is just a reminder that diving in the heart of the emerald will first have to be a battle against myself and that pain. We will have to deserve entering that realm. 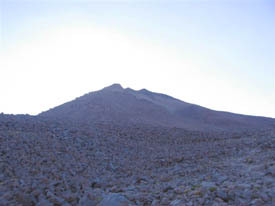 Left: The path to the summit. 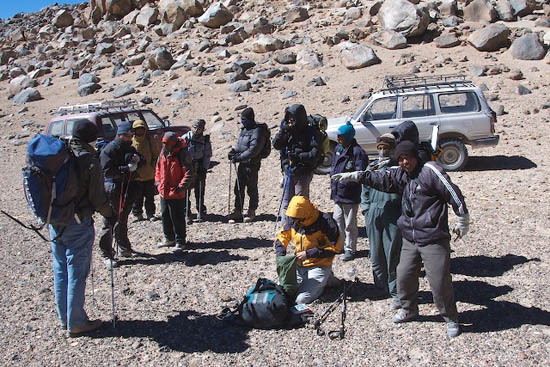 Right: Team members on the shore of Summit lake. 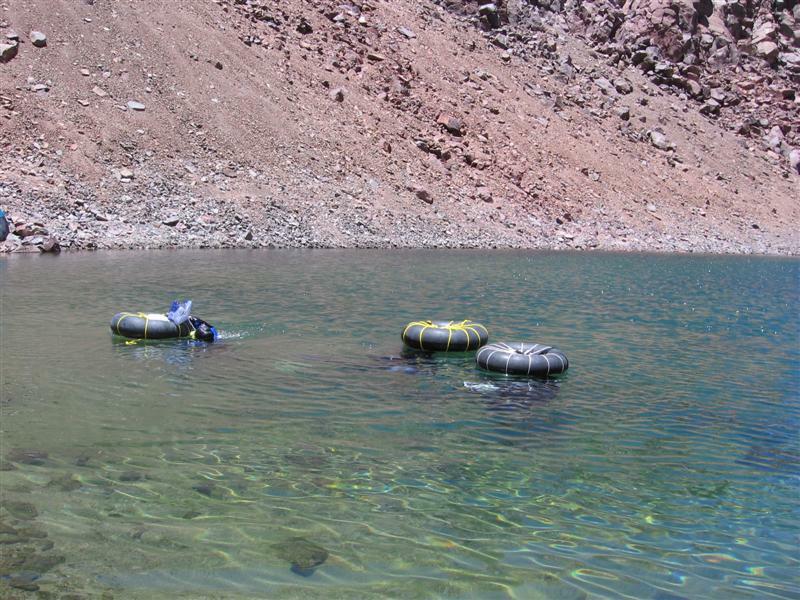 Note floats for divers on the lake. Four days and three nights at the summit...An unlimited view from the summit camp over the altiplano and the towering volcanoes surrounding us. Interestingly, that much space leads to more introspection. The camp is built; the mood in the team is excellent...I am happy too. However, I know that deep inside each of us there is a lot more pressure than usual, a lot kept inside each of us. Everybody smiles and behind the smiles the thought of the two dives to come are always here. Everybody here has contributed to them, the divers being only the most visible part of this endeavor. But there is also Randy, our Dive Safety Officer who this year was not able to climb or dive with us. All of this happened at the last minute and required a complete restructuring of our team. We know his dedication to this mission and what must be his disappointment. We think about him. Without the fast intervention of Greg back home and that of the Stanford team, we would have been obliged to call the dives. Thanks to them, Randy is at the refuge, part of the support team and always on alert for us, for anything we need. His role is central to our safety. He has put so much effort into each little detail, making sure that nothing essential was left out: Evacuation routes in case of diving accident, millions of scenarios... He must have thought about them all. We have a great deal of respect for him and we also want to make it happen for him, for all these past months of teaching in the swimming pool and the ocean, the "yelling" at us to perfect the techniques and practice them over and over again to be as ready as possible in a place he knew would not forgive any mistake. The only link to our mentor and friend now is through a cracking radio but hearing him is good. There is Eric, our Dive Master. He too was not going to dive while he was supposed to. Because Randy could not join us on the mountain, he had to switch roles at the very last minute. He became our Dive Master to make sure we would stay safe and would watch us from the shore. I had to break the news to Eric two weeks ago, one of these times when being a team leader can make you feel the weight of the world on your shoulders. He also trained so hard for this dive, going through the certifications, coming at Ames to train with us...Whatever his feelings, Eric embraced his new role with complete dedication, never looked back and carried with him Randy's 3 kg safety bible absolutely everywhere...(we have photos to prove that he actually persecuted us with that folder even in the swimming pool in San Pedro during our last training before the actual dives, brandishing the document over our heads...).On top of that responsibility, Eric is also our medical point of contact, monitoring vitals for the entire team and making sure everybody is as comfortable as possible. Did I mention that he is also carrying out a great deal of the expedition's Education and Public Outreach (EPO), transporting his video camera everywhere, creating videos and in the near future, podcasts...A busy guy with the exact right attitude and a big heart at the right place. Cristian and Matthieu also have reasons to think about the dives. They have been designated squires in the past 10 days. They certainly were not prepared for that but showed a remarkable focus and dedication during our last training days in San Pedro. There, they learned when and where to attach the various pieces of equipment on the divers, how to organize the diving equipment and when to bring it on shore. They know how to activate the oxygen cylinders in case we need them after the dives. We see them lifting and holding the monstrous lead belts just before attaching them to us. If they make a mistake, it can have terrible consequences. They became very good at this and very fast. They, too, at summit camp, must be doing just like the divers: Going over and over again in their minds through all the diving protocols, all these sequences, getting them mixed up and being afraid this will happen up there. Still, they are smiling and looking at the limitless horizon. We all need each other. We have known each other, for most of us, for a long time now, but this year is special. We are relying on each other to be safe and the bond between us is palpable. I am also thinking about those who went out of their way, took of their time voluntarily, and contributed significantly to make our mission happen by teaching and certifying us, loaning us the equipment, took us on their boat to Catalina Islands for our very first three dives in the ocean with the CODE rebreathers...The Californian Garibaldi fishes, leopard sharks, and lobsters are far away now but Dominique, Eric, and Mike, while 13,000 km away, you are with us on that mountain. And there are the three of us...Clay, Rob, and me, thinking about what still needs to happen before we can dive in that lake, what should happen once we are there, and maybe also what could happen. The three of us go way back now but these past months have created a special bond between us. I was joking that I saw more of the bottom of the pool at NASA Ames in the past 4 months than my office but what I did, they did it twice as much, just to make sure. They make me feel safe, although they keep suspending me to that rope and adding lead on me! Clay and Rob are both experienced scuba divers. In that realm, I am very, very, low in the foodchain with my 5 month experience...I listen, look, and learn...My 25-year experience as a free diver still serves me a lot. Diving with pure O2 rebreathers is as close as possible to free diving: No bubble, silence, and a very light system carried as a third lung on our chest. The sliding line we are suspended to in order to avoid stirring the bottom sediment will also help me since I am not quite expert in buoyancy control yet. That will circumvent the issue. I love free diving for its freedom and lightness but I also understood that if I wanted to achieve my scientific goals in the Licancabur summit lake, I needed to make the step and certify scuba, which I did in May 2006. In August, we all certified O2 CODE rebreathers, and here we are...Tomorrow will be our first contact with the real summit and the lake, a day of science, an interlude before the two following days marked on our schedule "Dive 1" and "Dive 2". A green emerald is waiting for us, just 100 m below in the crater. The reflections of the sun create millions of sparkles like diamonds in this crown jewel. I never saw the lake this way, never...Its beauty and majesty are magnified and it soon becomes clear why. The water level has indeed risen, not just a little but a lot since last year, I would say between 50-80 cm. The "Chapel" is underwater for most of it. The level is even higher than in 2002 if I judge correctly. The photos will tell. We now descend and the peaceful crater is transformed into a busy ant colony. We all go to our tasks: staging the area for the future dives, collecting water, sediment, microbial life with plankton nets, establishing the first complete bathymetry of the lake. There is a great sense of accomplishment here. We see the profiles of the lake's topography appear in our computer screen as our boat is going across the water. At the same time, the thermal mapper is giving us an idea of the surface water temperature...+4.7C. No doubt, we need dry suits. Those maps will be our base documents for the diving and will help us localize the deep points. The deepest logged is 16.27 ft, close to 5 meters deep. The maps will also be used to position our GPSed underwater samples into these documents, allowing us to co-locate our results within their specific environment. Next in our science program is the servicing of our meteorological station and the positioning of the Eldonet. We are done by 3:30 pm but cannot leave the crater as yet. We are supposed to have a satellite link with the French Cite des Sciences in Paris between 3:30 pm and 4:00 pm. We open the link but will unsuccessfully wait for their call. By 4:20 pm, it is getting cold and windy and I make the decision to go back to camp. Our countdown starts as soon as we are leaving the summit camp. That slope again...We are about two hours away from getting in the water. It is 9:00 am and we have to climb before being even able to enter the water. The weather is perfect; the lake surface is of glass, still, no wind. Its transparency is inviting. It looks like we have a rendez-vous today. We need to pre-dive the CODEs. We have our familiar blue tarp on the floor, the difference being that there is about 6,000 m of altitude difference between this time and last time I saw it. Sounds like we are going for it. Everything is lined-up on the ground. Putting the canister of scrubber in place...Attaching the O2 cylinders...Verifying the valves...Inflating the bags and taking the units in the water to search for possible leaks. A few more minutes and we start quitting our mountaineering clothes to exchange them for diving gears: Undies, dry suits...We look at each other often and smile...We look at the water. Today, our goal is to assess the diversity of life in the lake. Here we go...The squires are coming closer as Eric starts to go through the checklist. Cristian is my assistant. He attaches the rebreather on me, verifies all the clips. Then comes the painful part...Attaching a 47 pound lead belt around my waist. This is close to 40% my weight! With that on, I am not going anywhere far on land...I feel like a whale, a mammoth, or maybe a hybrid of both. Now comes the mask. With that on, I enter an inner world, still vaguely connected to the outside but already elsewhere, in that lake. 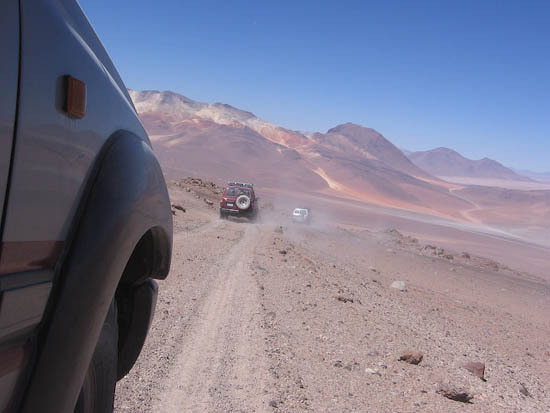 My free dives in 2003 and 2004 at Licancabur were light, with an immense sense of freedom. The encounter this time is different. I feel like a knight in armor, a knight with so much expectation, ready to enter a mystical realm. Entering the emerald...Conquering my fears, which undoubtedly are here. I feel so heavy, so cumbersome...This is the price to pay to enter the emerald. I hear the commands and the calls; I see Rob and Clay. We sign "okay" to each other. The last piece of equipment to get on us is our fins and we are in the water but not completely ready yet. Our squires clip us to our respective floats. A line is our umbilical between the surface floats and the bottom. The rebreathers make no bubbles. The floats are the only means for Eric to know our location underwater. Our lines also allow us to hover slightly over the lake bottom made of thick muck. We want to sample it, not stir it, otherwise we will be lost in an organic fog. We verify our equipment a last time; Eric starts the 2 minute countdown after we purge our system. It is now time. The shallow and cold water near shore is bathing us in sunlight. The emerald has turned into gold...The water reflects the sun on the sand beneath us, which rays can be seen one by one entering the crystal water. For now, I am still more aware of my equipment than of my surroundings. Swimming some more...Then I realize that those few meters from the shore have already answered one of our fundamental questions: Can life survive and adapt in this lake? We have to almost force our way through millions of copepods, small shrimps, worms and other minuscule things I cannot identify, not to mention everything else that is attached to the rocks. 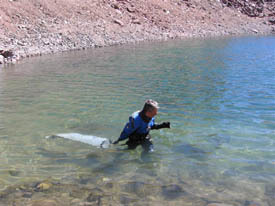 Left: Nathalie carries plankton net for collecting samples from Summit Lake. 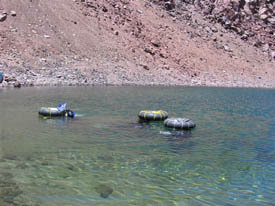 Right: Floats used by the divers to attach lines and equipment. The lake is fascinating. The sand is covered in places by what looks almost like bloody patches. Those are copepods. Now there is green and then there is white. Let's start by one end. It is obvious that the limiting factor will not be the diversity but the cold, already very much present only a few minutes into the dive. Rob is to my left, at about the same level. Clay is hovering above me. I get my first sample bottle out, show the number to Clay for a photograph as planned and try to get a sample of the red copepods on the sand. Although higher than me in the water column, Clay and Rob start to stir the bottom with their fin movements and my sampling target disappears in a milky cloud. I sign them to keep their distance for a few moments. I spot another of these patches and this time collect it. I start to be able to focus more on the task than on the means to get it done. At some point, my sample bag escapes my hand already slightly numbed by the cold. The thick gloves do not help either. I see the bag going up and Clay extending his arm to catch it. For a second, I had flash backs of the space shuttle, watching the astronauts sending each other various things through the cabin...The movements are slowed down just like in space...Clay passes the bag back to me. After this episode and the adjustment of my lead belt, we pursue our dive. Time is passing and we are still in the shallow regions, at most at 2 meter depth. There is so much to see and collect right here. What captures my attention next is some whitish material seemingly plastered on top of brown rocks. We reach them. Now, I am comfortable and just focusing on what is in front of me. I settle near the bottom, grab a first sampling bottle and think about scrapeing the material out. This is when I see that there is volume to it. I pull on it and turn it. That makes my day...Green algae are hiding underneath the white material. I spend minutes there, opening one bottle after the next, Clay taking photos and Rob video. I finally completely forget about the suit, the lead, the rebreather, the line...Those samples will be for our colleagues at Ames. As I finish collecting this strange material, I realize that now the perception of cold starts to invade my body a bit too much, just as I really started to feel at home here. But it would be unwise not to listen to the warning signs. Hypothermia is never fun, especially not at this altitude. I sign Clay and Rob..."Cold"...They start to feel it too so we sign "up" and we start our ascent back to the surface, 8 cm per second. Once all our equipment is clipped on our floats, Rob comes and unbuckles my lead belt that I feel slide along my legs. It is still attached to my line so it won't sink but all-of-a-sudden I am free from that burden, floating like a cork, immensely light. We are about 20 meters from the shore where we started from. That tells a lot. There is both exhilaration and some regret in me not to have been able to reach yet the deep parts. However, what we saw here was so fascinating. We will go deep tomorrow. What counts now is that we made our first dive, we are healthy and safe...and happy as clams! We reach the shore where Eric, Matthieu, Cristian, and the porters are waiting for us. They remove our masks and the rebreathers and place medical oxygen masks on our face. I do not feel the need for that but it cannot hurt. For the next hour, we will go through the monitoring of our vital signs (O2 saturation, heart rate, respiration, blood pressure, as well as a survey of our awareness) every 15 minutes. Two hours after exiting the water, we are back at summit camp. In my open tent, I look at the limitless horizon. Did I dream? The bags of samples are here as witnesses of the contrary. Today, we entered the emerald, a timid entrance just enough to tempt us to doing it again tomorrow. This time, we will go to the heart of the lake, to its deepest. The sun sets on our camp and I give my thanks for that day, that unique experience, for the safety of my companions and mine, for somewhere having fought my dragons back. Left: Rob (foreground) breathes medical oxygen after the dive. Right: Cristian and Matthieu examine rebreathers after removal as Clay looks on. November 20. I wake up ready this time. I have no second thoughts. I want to go back up there and dive. It does not matter that the night was not so good. I feel great. 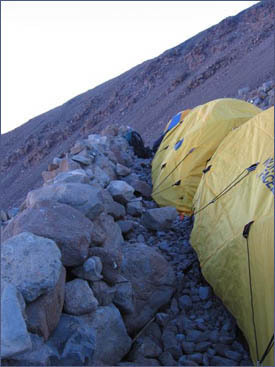 We pull out of summit camp around 9:00 am after a radio contact with Randy at the refuge. By 10:00 am, we reach a still lake. Perseverance...This is our day. By 11:30 am we enter the water. This time, Rob will collect the sample. Clay is holding the still camera and my mission is to make a video of that dive. Eric hands me his video camera. I trained a bit with that of Clay before, never with this one which is slightly heavier. But, that's not important. They are very similar. Our goal is to collect sediment every 50 cm depth down to the deepest part of the lake. Last year, although the lake was frozen solid, patches of free waters allowed us to collect a few samples near shore. The preliminary results were extremely encouraging. As a result, no smelling the roses in the shallow this time. We go for a B-line toward the center of the lake, the deepest part. Everything is comfortable for me today. Clipped to my line, I am suspended between Heaven and Earth in the heart of the emerald lake and I am hovering above Clay and Rob, choosing my angles to shoot, just plainly enjoying the ride and making sure to capture what my companions are doing as well as for the first time documenting the entire lake. Rob loses no time, and at each sampling depth takes a numbered sample bottle that he shows to Clay's camera. I have them both on my screen. Between two samplings, I move around and start taking panoramas. I would be lying if I said that there is not a little anxiety when I am 180 degree from my companions...Maybe this will show as a slightly accelerated panorama at that stage...The view is mesmerizing. The golden sands of the shallow ends have now disappeared and have been replaced by huge blocks here and there in dark blue waters punctuated by dark and red deposits on the lake bottom. Minuscule shrimps and other organisms are surrounding me and float in front of the camera. The floor is littered with copepods. Rob is now at the deepest, right next to a giant boulder. He seems so small all-of-a-sudden. Time is flying. I am not cold...I finally found my place here. I now feel welcome in the heart of the emerald. I have a hard time believing that 25 minutes have already passed since we started. Clay signs that he is cold; Rob acknowledges. They look toward me. They sign "up". I see both of them grabbing their lines with their hands and start their ascent. I film...I see them clip their equipment to their float and I still film. Clay is free from his lead belt now. This is when I realize that I am still down, filming, that I still have to go up myself. I look around a last time. What a magical encounter. Licancabur opened his heart to us for two short moments in time but it is time to leave...already. I ascend. When I am close enough underneath my float, Rob grabs my camera and clips it to the rope on the float, then he unbuckles my belt. I surface with my fist in the air, overjoyed. The three of us are at the surface, next to each other...on the opposite side of the lake. The good news is that we actually documented the entire lake. The other news is that we have to swim the entire length of the lake now to get back to the shore where our support team and Dive Master are waiting for us. Adrenaline...We are holding our lines and floats and swim back toward the shore. Half-way through, I realize that rushing was a very bad decision. I am short of breath even with the rebreather on. We are still at ~6,000 m after all. We see a torpedo coming at us in the water...Eric. He knows we are not in trouble but still wants to help by towing us. We decide to continue on our own, just slower. Once on the shore, this time, we ask for oxygen...We will actually empty two cylinders each. Our vitals are fine, everything is okay. This dive was just more demanding, deeper, farther. We made it and now that we are warmer in our support diving tent on the shore, we joke like kids and pause to think about what we saw, our impressions, the samples we brought back, and the experience of a lifetime this was. 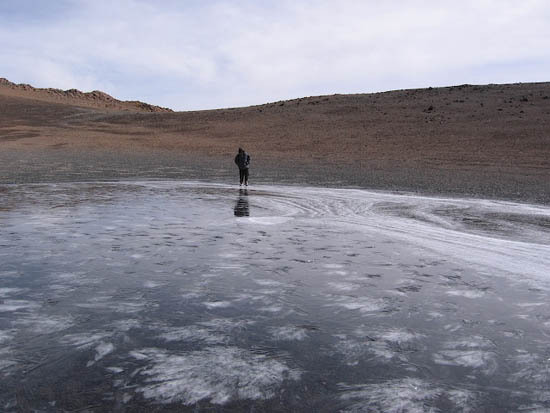 That same day, we left Licancabur and descended back to the refuge in two hours. With each step I took I could see a rock, a reflection, images of the colors of the lake and its living realm. Two visits, one of 31 minutes, the other of 25 minutes, many samples, but a unforgettable memory. I could not stop looking at the summit as we descended and give thanks for the privilege of the visit. The door of this mystical mountain closed behind us...For three days in a row after our return to the refuge, clouds and snow battered the area. The time had passed. We usually learn about history in books, chapters assembled by scholars and experts who dedicate their lives to assembling clues about our past to pass them to future generations. Every single human being on this planet is part of history, the one written each day of our lives and which tomorrow will find its way into the history books. It is a lot more rare to see the past and the present collide in brief instants, like a direct message coming to us from the dawn of time. All-of-a-sudden, they are here in front of us, a living history, an uninterrupted thread between the past and the future in a transient present. Since the beginning of the High-Lakes Project, such encounters have happened three times, two of them in the past week. The first one was in 2003. 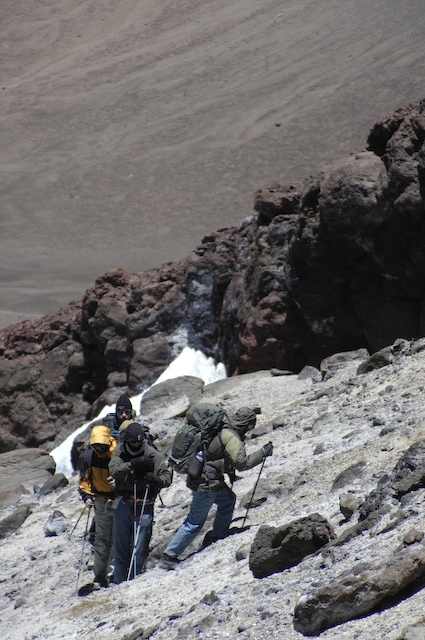 Our team descended from the Licancabur summit through the central gully of the volcano. This fastest route was the most appropriate for us since we had left the summit a little late. However, it made us pass through a few delicate passes and notably a very unstable talus. I did not say anything but as a geologist, I knew that such talus could be mobilized very easily. If caught in the middle of it, there was little that could be done, especially on a 42 degree slope. I was right behind our guide Macario. I do not know if he perceived my anxiety or felt worried himself, but he stopped, put his backpack on the ground, opened it and extracted a small,colorful mesh bag that he passed around his neck.Then, his right hand grabbed another bag in the backpack, a plastic bag, full of coca leaves. I did not think it was necessarily the best time for a coca break, but at least it also gave me a breather to better assess the situation. What followed captivated me... Years later, I still think about this moment. Instead of chewing the coca as he does many times when we ascend, to help with altitude, this time Macario spread in slow but precise movements the coca leaves in the four cardinal directions and started to pray. He was not praying in Spanish. He was praying in Quetchua, the language of his Inca ancestors. In front of our team, a window in time had opened into the past, given in direct line by a descendant of one of the most illustrous civilizations to rise at the surface of the Earth. He was repeating words and gestures hundreds of years old. It did not last long but time seemed to stand still. When he was done, he put the two bags back into the backpack, turned back, looked at me, and just said: "We will be fine now". The second encounter was a week ago, at the beginning of our ascent of Escalante. There was no intended ceremony. I wonder if anybody other than me in the team saw it. I just happened to be looking in the right direction. Macario dug a small hole in the ground, grabbed a handful of coca leaves and buried them. A simple gift to Patchamama, the Mother of the Earth, protector of the Inca people, and Macario took the lead of our group. The third time was yesterday, the most intense of these encounters with the past and the Inca tradition. 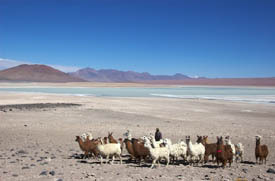 Macario told us that there was a caravan of llamas crossing the Inca pass between Juriques and Licancabur and heading back toward Quetena. The shepherds wanted to revive the tradition and follow that route again. To us, this was a rare opportunity to see a unique spectacle of a colorful caravan of llamas. Little did we know how traditional this encounter would be. When we arrived, the shepherds already had given thanks to Patchamama. 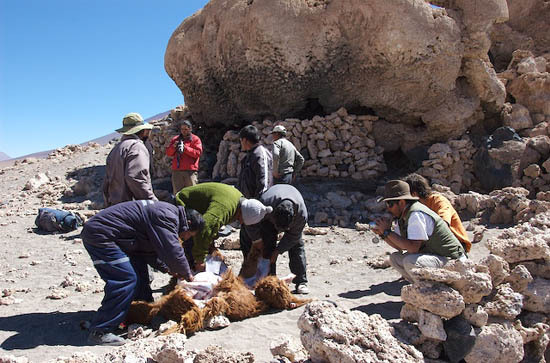 They had sacrificed one of their llamas using the traditional Inca knife, cutting its throat. Seeing such a magnificent animal lying in such majestic and limitless landscape where it was running freely that morning was tearing my feelings apart: There was that part of me that felt intense sadness and then the other, the one that had me stand right next to this beautiful llama until the ritual had ended. Living history... Two shepherds skinned it and then did what the Incas did hundreds of years ago, but not only the Incas, the Romans, and the Greeks as well, thousands of years ago, and many other civilizations. With surgical precision, they removed its internal organs, first the guts, then the lungs and heart and deposited them on a rock nearby, an offering...The two shepards were talking to each other and also praying. When they were finally done, they gently repositioned the llama on the ground, rather its empty envelope. As hard as it was, it was a magnificent allegory of life. 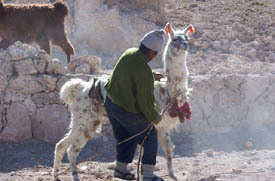 The spirit of the llama still roams the altiplano, only the empty envelope is left for us, terrestrial human beings to see. 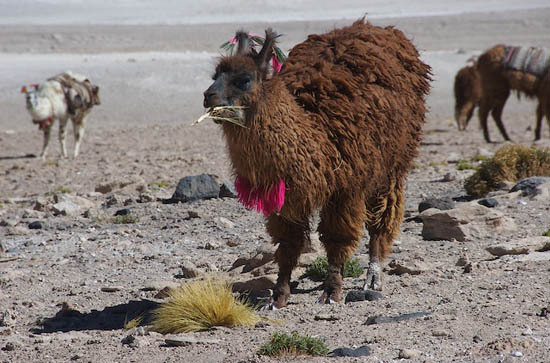 Patchamama will protect the return of the caravan to Quetena, colorful llamas in the brown and yellow altiplano.The llama that was sacrificed had little ribbons in its ears, some green, some red, some green and red. Macario gave me a red one. I thought about keeping it and bringing back home but it would not be appropriate.This little llama lived and died in the altiplano, his death serving the protection of the people living here and those who pass here. 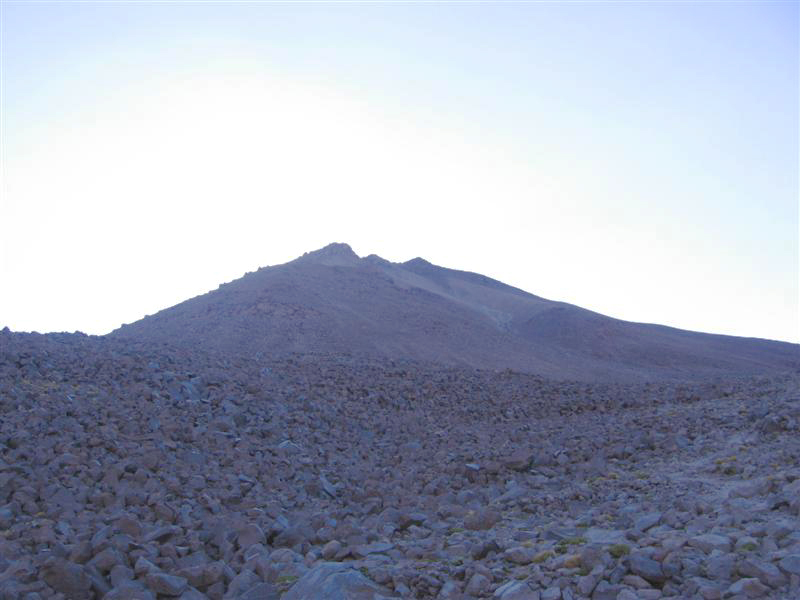 Tomorrow we start our ascent to the summit of Licancabur. Our team will need to be stronger and better prepared than ever to accomplish what we came for: scuba diving in the summit lake. Like the Incas before us, we want to understand where we are coming from and what lies ahead of us. Therefore, it just feels right to me to give back to the little llama what belonged to him. I will dig a hole in the ground at the foot of our trail, and maybe the little llama will have a word for us to Patchamama and both will look after us. 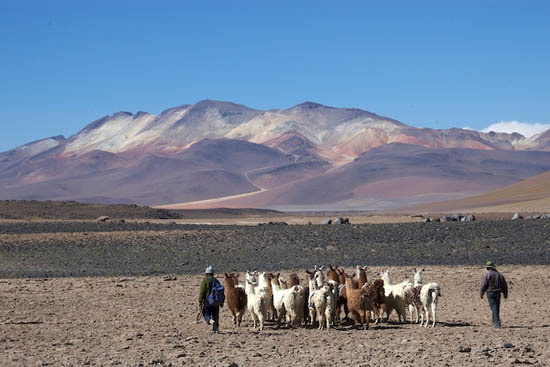 Bolivian and Chilean shepherds sacrifice one of the llamas in their herd, rekindling a ritual that is thousands of years old. One of the llamas enjoying a lunch of paja brava, a common grass in the altiplano. 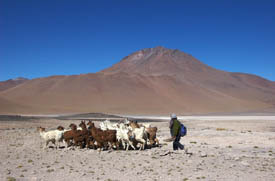 One of the shepherds begins to move the llama herd at the start of the return journey to Quetena. Left: We are given a demonstration of how to lasso a llama. 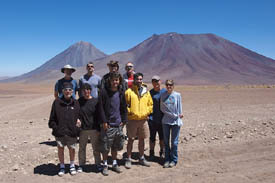 Right: On a more mundane note, here is a group photo of the High Lakes team on our way back to the refuge from San Pedro de Atacama, with Licancabur (l) and Juriques in the background. From left, back row: Henry, Rob, Eric, Randy; front row: Edmond, Nathalie, Matthieu, Cristian, Clay, Sandy. Why do we explore? What pushes us to go higher, deeper, or farther than the previous generations? I wonder about this question over and over again, especially when climbing becomes difficult, breath is short and the wind is picking up. I know why I do this. This is my passion, the same passion that has driven many explorers in the past, drives so many today, and without any doubt will drive others tomorrow. But I look around and I see my companions on the slopes of Escalante today, many of them I have known for years now, shared so many climbs with, in good or bad weather�And there are the others that I have just started to know a few weeks ago but who already have shown the same quality of friendship, dedication, and good heart than my "old guard." Many of them are not scientists. There is the young student learning the ropes of astrobiological exploration of the extreme and obviously enjoying it, the engineers, even a captain of a ship, and a science writer. Why are they here? What is driving them to push their own limits so hard? Right now, they are trying to climb the slopes of Escalante with me. The central gully is tough. We are all looking at our feet... One step after the other. Nobody looks at the summ... Still too far. Edmond one day summarized the ascent of Licancabur in words that only a man of his stature and experience could have: "A million ste... A million times questioning ourselves and the reasons why we are here...A million times testing the human character in this world of ours and just becoming stronger..."
After five years of exploring the volcanoes of the altiplano, I can claim that Escalante is the toughest summit we have climbed so far. This is our first time here. 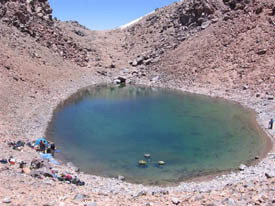 While lower than Licancabur, at 5,700 m Escalante is mostly made of steep scree and ash slopes, except for the summit rim. What makes it trickier also is that we have to go up on a flat for a while and then go down to reach the base of the volcano. Only then does the ascent begin. 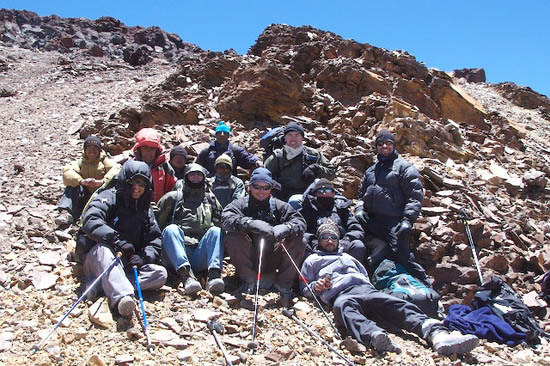 Three of this crew have never climbed anything higher than 4,300 m or less except for our first training in Juriques few days ago where they reached 5,400 m. Today, we start at 5,200 m and will go to 5,700 m. We need to be ready for Licancabur and its 6,004 m summit. Trial by fire - or should I say by ice? The wind is cold this morning. Many snow penitents are visible as we climb. There are isolated blocks of ice that remain trapped in the shade of rocks. The beginning of the climb is fine. We go slowly but surely. Things can change quickly at those altitudes though... Half-way through the gully, my legs are betraying me. I was not feeling too good yesterd... A short-lived bug but apparently it left its marks. Still climbing thou... Okay, look at your feet... One step after the other, find a rhythm and get the machinery back on track again. It will take me about 30 minutes to feel decent again and about 10 more minutes to finally feel great. Edmond is not with us today. He will train on Licancabur tomorrow but he is always present in my mind and in my heart. I can hear him just as if he were next to me: "Look at your feet, forget everything around you, concentrate on the next st... The next step is your goal". This works again this time... The team goes up. How many of my companions are going through the same roller coaster of sensations? Nobody complains, we go up. We just look at each other and smile. The body language is very important to decipher in such case. Suffering is always present. That�s part of mountaineering. It is important, though, not to miss the important signs, those which could spell trouble. There will be none of that today, fortunately. In two hours we are on the saddle of the summit, the lower part of the Escalante crater. The view is simply stunning: to the right, Sairecabur towers over 6,000 m. In front of us, to the East, Laguna Blanca and the refuge where Sandy and Edmond are our safety links today. The refuge is a small speck on the horizon, so far away. I attempt a radio ca... Amazingly, Sandy responds right away. We are fine, I let her and Edmond know. On the saddle, we are again exposed to the wind. Not a good place to stay for long. The gigantic crater of Escalante, very deep and wide, shows the sign of changing times�The lake that once stood there is now gone. The ecosystem that populated it has disappeared without anyone learning about it. Life gone quietly in one of the most magnificent landscapes of Ear... Knowledge lost forever about what was there, maybe some answers about ourselves and where we come from, as well. There is a sense of urgency. We are at the crossroads of time, our time. We are a special generation that has both the burden, privilege and responsibility to live through a climate change and learn about it. It is also our responsibility to the next generation to collect as much information as we can about our biosphere. Species have disappeared in the past, and will continue to disappear in the future. We can call it evolution, climate change, passing time. However, it is of the most fundamental importance that we keep track and archive all we can about what is here today. From the most modest microbial organisms to the most evolved species, all passengers of the same spaceship, we are all part of the same biosphere, all related to the same planet, all connected to each other. Ignoring one of us is ignoring an essential part of ourselves. This is why I continue hiking, and probably why my companions do, too. A sense of something much bigger than us. We are temporary beings in a greater scheme, the carriers and messengers of a message of life, trying to find our place on this planet and understand how to build our future. We leave the saddle now to go higher on the rim. The small ponds of Escalante are farther away. The wind is picking up. We settle for a moment on a ledge, waiting for the rest of the troop to join. They are just a little behind but still in line of sight. It is too cold and too windy. I have to make decisions. The safest thing to do is to now make two groups. 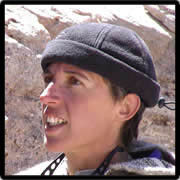 Those who feel not able to continue will initiate their descent with one of our guides. I am taking a squad to head toward the small ponds, still about 20 minutes away. I feel so good now. It is difficult to believe that I had such a harsh time few hours before. Clay, Matthieu, Victor, Eric, Macario, and Marcelo come with me. Our goal is to get to the ponds and collect water and sediment samples and do some limnological work. The wind is beating us up. It is now blowing at a sustained rate of between 60 and 80 km/hr. We are just below the rim, a little sheltered. Clay is the first one to see it... The first po... It is now about 200 m from us. We have to cross the completely exposed summit flat but now we can see it. The pond is in fact a series of small ponds, the larger maybe 10 meters by 3 meters. The traces on the ground show that they were part of a larger body of water not so long ago. There is a larger one about 800 m away. With this kind of weather, I cannot make the decision to try to reach it. That would be exposing the team more than what would be safe. We are now on a mission. 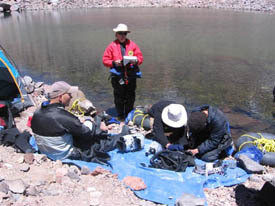 Everybody in the small squad is busy with the various experiments: filtering water, sampling sediments, passing and marking sample bottles, recording positions and elevation, taking photographs. We are keeping low to the ground. The sand is warmer than the outside air and the wind is passing over us. It takes us 15 minutes of work, looking more like an ant colony than anything else, but we are done. I look at these samples packed in the ice and look at my companions. We all came up here for these samples. Why are we exploring�Deep inside us, we know why and this is what keeps us going on the slope, in the wind, and in the hardship. We have for 15 minutes forgotten about the three hours of suffering. We have them, those samples that will add to the body of knowledge about our biosphere. We are dirty, dusty, and cold, our hands in icy water. There is nothing glamorous about this except the pride we put in bringing back those samples, soon to make sense of what knowledge they will bring us. The return is both fast and cautious, first a bit protected by the rim of the crater, then fully exposed to the wind. We reach the first group who started their return before us at the foot of Escalante. Everybody is well and in good spirits. Now, let�s hike up the little ridge and cross the flat to reach the cars... This is where the wind is waiting for us, so hard, so cold. I spend most of the last 500 meters going sideways, sometimes almost thrown out of balance. Progress is tough. As I almost fall, I stop to anchor myself. This is when I feel two hands on my shoulders: Victor and Marcello. I did not even know they were next to me. My big jacket hood reduces my peripheral vision. They are not much heavier than me but the three of us join forces and we finally make it to the cars. 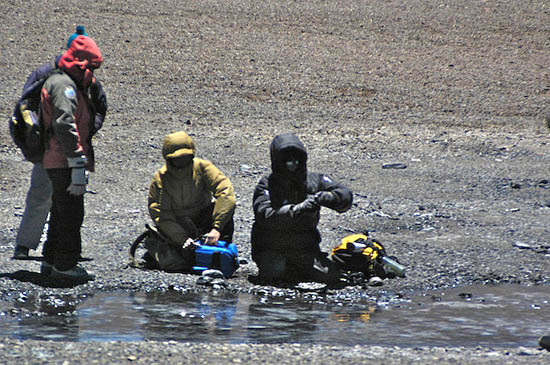 If the High-Lakes expedition is about astrobiology, science, and knowledge, it is also, first and foremost, about these guys, without whom nothing would happen, these more than brothers to me who in silence and suffering make sure that everything happens and happens safely. Those samples that one day might end up in your labs and will make you famous scientists because of unique discoveries of life in extreme environments, always remember that you also owe them to these men. They won�t have their names on your publications, but without them, you, in the warmth of your lab, would not have those precious samples. They are the messengers and the carriers. They are the essentials of exploration. This is why I am so proud of exploring next to them. Our view of Cerro Escalante en route to our hike. A couple of days before the whole team hiked Escalante, a small reconnaissance group climbed the mountain to check it out. Here, Macario examines the larger pond at the summit. Photo by Victor Gaete. 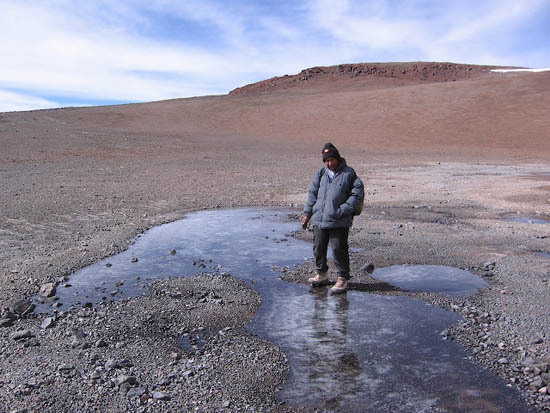 Macario examines one of the smaller summit ponds on Escalante. Photo by Victor Gaete. On the road to Escalante. Photo by Cristian Tambley. The team gets ready to begin our ascent. Just below the summit ridge, we took a break and hunkered down behind a rock to get a bit of relief from the relentless wind. 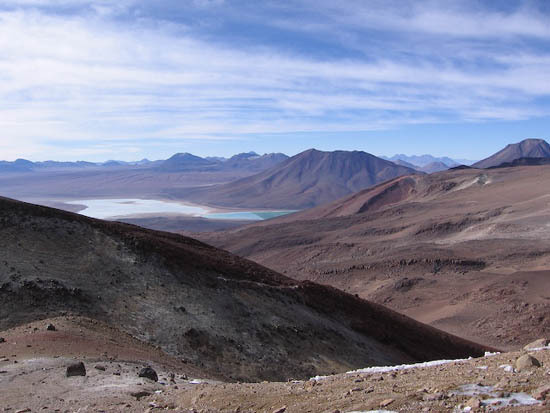 From the top of Escalante, we had a spectacular view of Laguna Blanca and Laguna Verde. Photo by Victor Gaete. On our descent, we had a stunning view of Cerro Sairecabur, a nearby volcano. And finally� This was what sunset looked like at the refuge the night before we climbed Escalante. I did not think I would start writing so soon upon arrival but here it is, our first morning at the refuge. It is 6:00 am and most everybody is still sleeping, except the locals, who are already baking bread. I went outside to see the sun rising over Tres Cumbres. 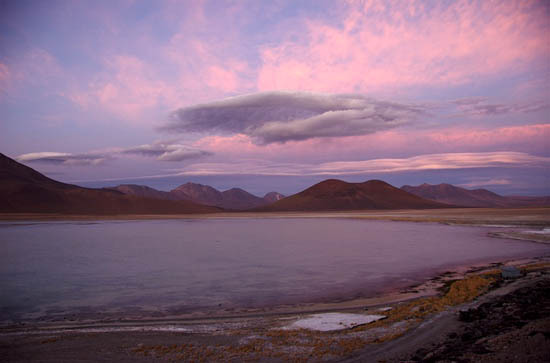 Laguna Blanca is waking up to the sounds of flamingos and ducks. The warmth of the sun on the cold water creates a mist that travels with the light wind. Time passes over the lagunas as it does for all of us. In this battle against time, which only time can win, the high lakes are apparently not giving up so easily after all. After having witnessed the lakes recede for four years, I had a feeling when we arrived that something was different, nothing really obvious, just maybe a feeling. 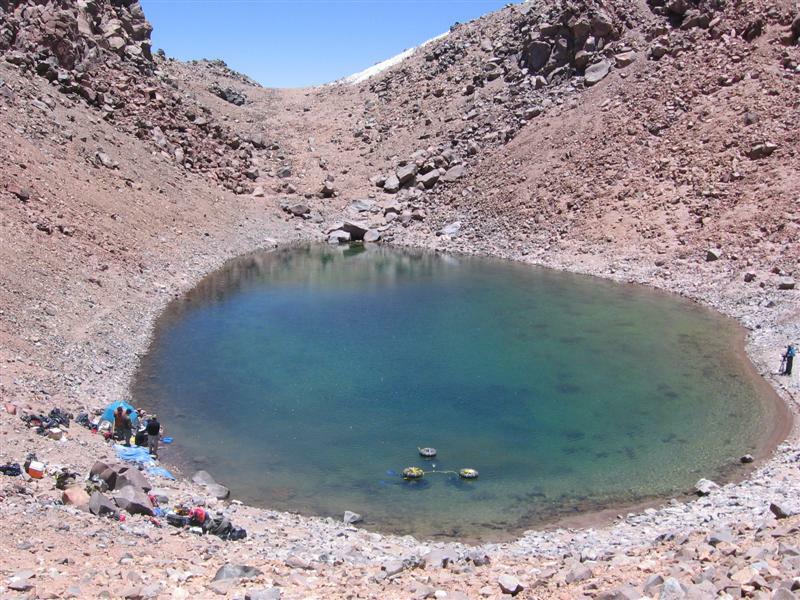 Later on, our guide Macario, after descending from Licancab�r with a group of climbers, confirmed it: The summit lake, for the first time in four years, has risen 50 cm. We will need to document this to really understand the extent of this change. If Macario is right, that would put the lake level close to what it was in 2002 or 2003, when we started monitoring it. This is certainly the result of the abundant snowfalls of last year - brutal, unusual weather. So, that was it; this is the feeling I had when I saw the lagunas. More water, more freedom for life to evolve, a break in what in the end will be a loosing battle, but for the moment, a fight back. A sense of joy is in all of us. Nobody is ready yet to see these extraordinary ecosystems disappear. But this year seems to be the year of survival in the Andes, a break, a breather, some peace and serenity found again. I should have known. The first to greet us at the refuge was Mimi, our little kitten from last year. When we arrived in 2005, she was tiny, very young, very fragile, trying to survive in brutally cold weather. 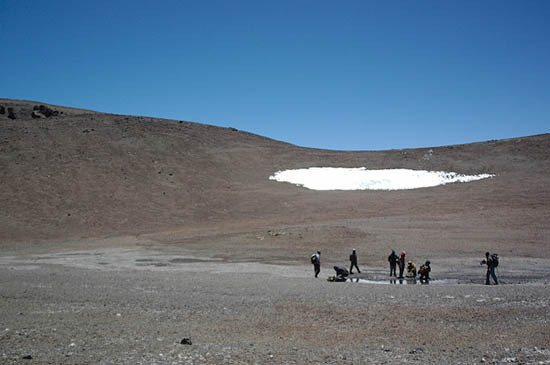 The altiplano was battered by strong winds and temperature below -30C. Mimi adopted us and lived on our tuna for 6 weeks. When we left, I did not think we would see her again. But there she was, waiting for us. She jumped on my lap, and then Rob's, her two favorite victims. She showed us she had recognized us. She went right for our water fountain as she did when she was a kitten. She is a healthy grown up now. She has beaten the odds, at least for this year, but it is much more than most of others have done. Her mom is still here too. Survival runs in the family. Unlike last year, the weather now is calm and warm. This is a pause, a moment in time, a precious moment in time.